Kenny Miller savoured his milestone goal which claimed three Championship points for Rangers but admitted there was more than a touch of good fortune about his spectacular strike in Dumfries. It was the veteran front man’s 100th goal in Scottish league football where he has variously found the net for Rangers, Celtic, Hibs and Stenhousemuir over the past 17½ years. 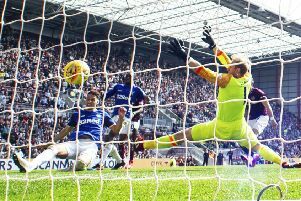 Miller’s 64th minute shot from distance, which initially prompted ironic cheers from the Queen of the South fans before it looped implausibly into the top corner of the net, was the only goal of the game as Rangers stayed eight points clear at the top of the table. “I think it was the slowest, highest shot that’s ever been seen at Palmerston Park,” said the grinning 36-year-old. “I was delighted it went in and there was an element of luck to it but if you don’t shoot, then you don’t score. “I was sure it must have taken a deflection with the way it fell out of the sky but apparently it didn’t. It’s a big win for us and I’m delighted we got it. It’s nice to hit that landmark of my 100th league goal in Scotland and it’s always nicer when it’s a winning goal. “I’ve been told my first Scottish league goal was the first of a double for Stenhousemuir away at Albion Rovers (in November 1998) when I went on loan there from Hibs. It was probably better than this one, because I actually meant it! “It’s a bit of a cliche, but these are the kind of victories that win you titles. There are times you have to grind it out and we did that today.